Randolph Meade Walker is a native of Heathsville, Virginia. After receiving a B.A. degree in history from Hampton University in Hampton, Virginia in 1972, he relocated to Memphis, Tennessee. He has remained a resident of the West Tennessee city since that time. Realizing the importance of academic preparation for life, he earned the M.A. degree in history in 1976 and the Ph.D. in 1990. Both were earned at The University of Memphis. In 2004, he received the M. Div. degree at Memphis Theological Seminary. For fifteen years, Randolph Meade Walker worked in the business world as a sales account executive with AC-Delco Division of General Motors Corporation. Following that experience, he was a faculty member at LeMoyne-Owen College for another fifteen years. As a clergyman, Randolph Meade Walker has served as an assistant pastor of New Elam Baptist Church in New Kent, Virginia and pastor of Pilgrim Rest Baptist Church of Henning,Tennessee and New Philadelphia Baptist Church of Memphis. Presently, Randolph Meade Walker is the pastor of Castalia Baptist Church. He was elected to that pulpit in 1998 with an unanimous vote. 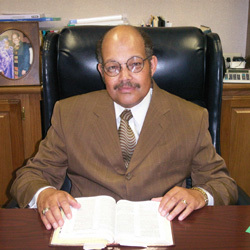 He also now serves as Moderator of the West Tennessee Baptist Missionary and Educational Association. He has held this position since 2009. Randolph Meade Walker writes extensively. He has authored numerous poems, articles and sermons. Four books have also been written and published by him. Several manuscripts are presently in progress for future publication. Dr. Walker travels in a commodious fashion. He has delivered professional lectures across the United States, and in Mexico, Senegal, Egypt, and South Africa. He has delivered sermons on three continents. Numerous awards have been bestowed upon him. Included in the list are his being named to International Who’s Who, Who’s Who Among America’s Teachers, and Who’s Who in America. Also in 2002, LeMoyne-Owen awarded him an honorary doctorate. Randolph Meade Walker is married to the former Miss Deloris Adair. They have two children, Jennifer and John, two granddaughters, Mackenzie and Madison, and a son-in-law, David Young. His resolve is to say something good to and about someone every day!